I absolutely love the color and style of this brush. 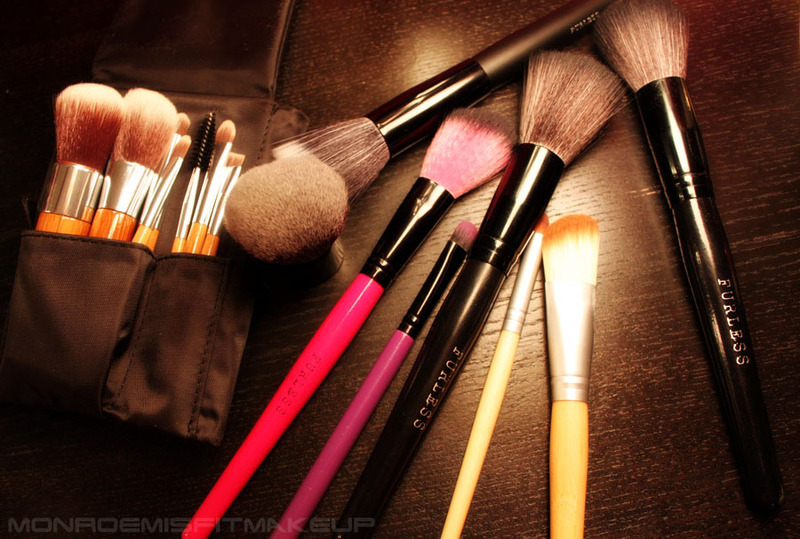 I want all my brushes to look like this! Most importantly though is the quality, and it's superb. The bristles are pillowy soft and the slight angled design lends perfectly to extending blush from the apples of the cheeks in to the contour. The shadow brushes are dense and soft. This eyeshadow brush is great for packing eyeshadow on to the lid and is gentle enough to blend with. They also have small & medium versions of this style. The fat & furless large blush brush is fluffy and perfect for dusting blush on to the apples of cheeks. It's a very dense bristled brush which is where the "fat" comes in. I like it best for applying loose powder. It's just large enough to target the T-zone areas with out over powdering the whole face. This fibre optic brush is not only for a stippling effect; it can also be used to apply cream or liquid foundation. This is very similar to the ever popular MAC #187, but a touch smaller. I use stippling brushes for liquid foundations, high pigmentation blushers/bronzers, & cream products, and this one provides seamless coverage. 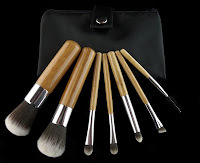 Flat Top Brushes are ideal for buffing in mineral or powder foundation's. This brush is softer and has longer bristles than my other flat tops. It holds it's shape while you buff in your product, but will be better suited for powders than liquids as it's not super dense. The bamboo angled blush brush is the only one that I didn't care for. The bristles are too stiff making it difficult to blend your contours out. I love the size of this brush, it's perfect for smaller facial structures, but it leaves "stripes" on the face instead of contoured depth. My absolute favorite brush of the bunch. All of my crease brushes are scratchy or better suited for blending. This one has the perfect amount of stiffness to it and is just the right size for creating a nice cut crease style. For being dense, it's also gentle. I have sensitive eyes and too much harsh blending irritates my eyes fast, but with this brush I can create a heavy mod Twiggy look and not have red eyes later. This adorable mini bamboo travel makeup brush set consists of a powder brush a blush brush 2 eyeshadow brushes a crease brush, and angled liner and lash/brow groomer. The cute case has a little zippered area to hold your makeup and other goodies. The Bamboo brushes from Furless are all fantastic and these mini versions are no exception. I love that I can pop this in to my travel bag or purse and it doesn't take up as much space as my regular brushes. If you're a fan of ECO Tools you will love these. I've never found a kabuki that I like better than Too Faced's, but this one is pretty good. It's just as soft and works great with mineral foundation or dusting off excess product. The small size also makes it easy to grasp and target specific areas. I had to share the color tipped kabuki's too, aren't they so pretty? 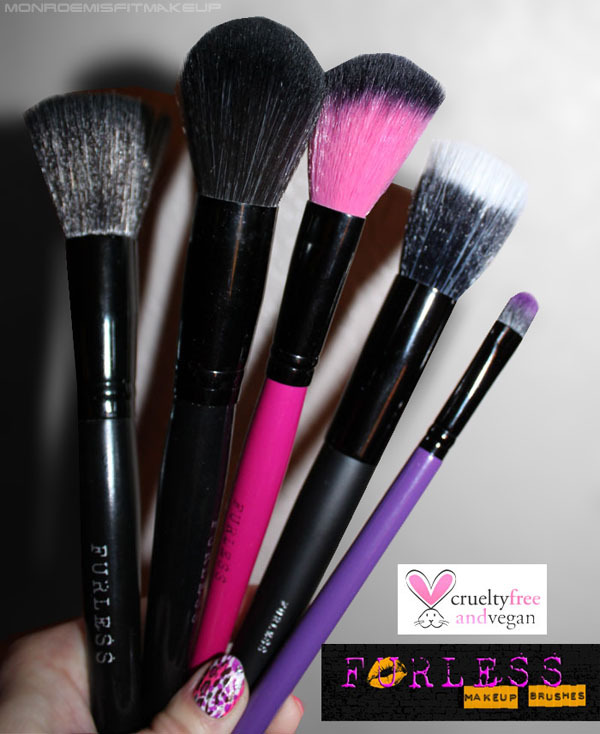 I am delighted with my experience with Furless and I feel great knowing that I'm being ethical and responsible by using Cruelty free Brushes. Their products are affordable, the shipping was quick from AU, and they have great customer service. 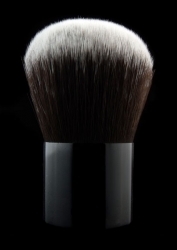 Furless brushes are suitable for both professional and your own daily use. If I had to pick my favorite's it'd be the fat&furless and the bamboo crease brush. 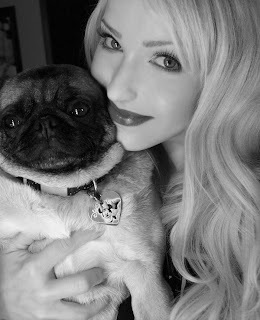 Furless offers a one time 50% off code to beauty bloggers and youtubers, as well as a 20% professional discount for Makeup Artists. They accept most major credit cards and paypal with flat rate shipping of $5 AU and $12.50 International. Also keep up with their facebook for more offers & discounts!